If you have been in Japan for some time or enjoy following Japanese cultural trends, chances are you have already heard the phrase B-kyu cuisine or B-kyu gourmet. It is often used in reference to cheap and tasty foods, but what exactly does the phrase B-kyu mean? The English phrase “B movie” was imported into Japanese not literally as B-eiga, but using the more natural wording B-kyu eiga. Out of context, the term B-kyu (B級) roughly translates into English as “B-grade” or “B-level” — in other words, something that is sub-par in some way, like a B movie. This has led many writers and translators to mistakenly explain the phrase B-kyu gurume as “B-grade cuisine” or similar, which misses the point entirely. For example, this article written by a shockingly uninformed writer describes it as “B-grade food” and also as a fad (only true if you define “fad” as a trend that continues for decades) as part of her unimaginative “look at this wacky country!” approach to travel writing. Unfortunately for diners everywhere, this type of misinterpretation/distortion is common in the Western world when it comes to the topic of B-kyu cuisine. In reality, B-kyu cuisine exists in pretty much every country around the world (under different names). 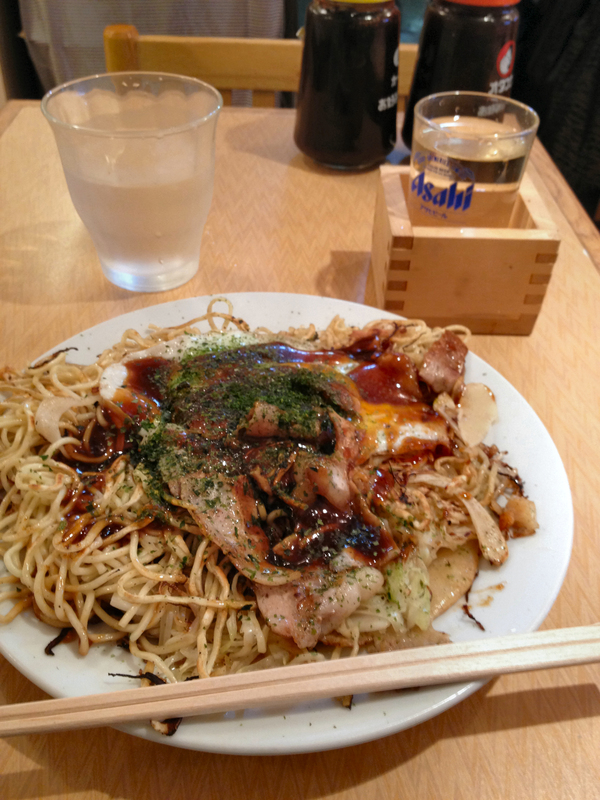 It encompasses ramen, takoyaki, yakisoba, deep-fried foods and other selections enjoyed by the average Joe (average Tanaka?) in Japan. The food is inexpensive, savory, filling, sometimes greasy and always satisfying. B-kyu is meant to act as a counterbalance to high-class cuisine such as kaiseki — it opposes the snobbish gourmet culture dating back to the Bubble years in Japan and instead focuses on down-to-earth, affordable cuisine that everybody can enjoy. In some cases, B-kyu cuisine also lacks the history and sense of established tradition found in other types of locally rooted cuisines, instead representing something innovative and fresh. Culturally, eating B-kyu in Japan is equivalent to going to your favorite local burger joint, pizza shop, burrito restaurant or food truck in the United States. Although similar in wording to B-kyu eiga (B movies), B-kyu cuisine does not imply a lack of quality. However, as with B movies, B-kyu in this case does allude to a certain cult quality as well as a surprisingly high level of satisfaction despite low prices. B-kyu food is rarely served at high-end hotels and wedding receptions, and a restaurant serving B-kyu dishes is not the kind of place you go to impress your date or celebrate a wedding anniversary. B-kyu does away with all the high dining costs that come from famous names, lavish food arrangements, stuffy traditions and upscale restaurant atmospheres, instead providing the hungry and tired masses with something scrumptious to enjoy together with a glass of beer after work or on the weekend. Personally, I think that B-kyu cuisine is much more rewarding than what is offered at most high-end izakaya and restaurants. Because our money is a direct representation of the time we devote to working rather than doing what we really want to do, wasting money is the same as wasting time, and time is the most valuable resource that we have in this life. I find it much more satisfying to spend my hard-earned money on a big plate of fried kushikatsu skewers with friends, some of Fukuoka’s top-tier ramen, or perhaps an iron skillet full of crispy, garlicky gyoza dumplings topped with a thick layer of molten cheese, than to blow it on a few tiny morsels served on an expensive plate in a restaurant with good mood lighting. I don’t care much for restaurants where waiters wear bow ties and bottles of wine are sold for upwards of tens of thousands of yen, because I feel more at home in a boisterous, bare-bones establishment with wooden benches, cheap drinks and food that leaves my stomach feeling happy. Give B-kyu a chance. You may be surprised at just how “A-level” it can be. This entry was posted in Food and Drink, History/Culture and tagged B, B-kyu, blog, cuisine, dining, Finding, food, fried, Fukuoka, gourmet, grade, Japan, Japanese, kyu, Kyushu, level, ramen, soul, yakisoba. Bookmark the permalink.